The American College of Sports Medicine recommends that a combination of free-weights and machines be used in a beginning weight-training program, progressing to greater emphasis on free weights is advised as strength training becomes more advanced. The Fitness Plaza’s Life Fitness™, Hammer Strength™ and DP Industries™ free-weight equipment by is the very best available. Dumbbells range from 2 to 160 pounds with over 15 thousand pounds of iron grip plates (plates with built-in handles). 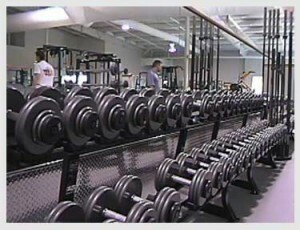 Our free-weight area includes more than 45 stations and over 10 thousand pounds of free-weights. Whether you use free-weights alone or combined with our excellent machines, you will never become bored with the wide selection of different machines and stations.